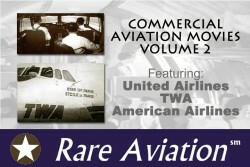 This DVD contains three separate movies featuring United Airlines, TWA and American Airlines in the late 1940s to early 1960s. Fly through history on American Airlines Flight Three in a 707 jet bound for Los Angeles. The DVD allows you to participate in all the many critical steps in flight planning in the early 1960's. You will watch all the behind the scenes work that leads to a safe and satisfying trip: weather analysis, flight planning, weight and balance calculations, fuel planning, and many more. You'll get to ride in the cockpit and gain a new appreciation for all the communication and cooperation that gets a flight off the ground and to its destination safely and on time. All of you out there who are American Airlines history buffs shouldn't miss this glimpse of U.S. commercial aviation in the late fifties and early sixties. B&W Runtime: 9 minutes. This film takes you through the highlights of the rich and historic development of America's aviation development. Spectacular pictures begin with footage capturing the early flights by the Wright brothers allowing you a unique glimpse into the birth of our country's aviation. But this is just the beginning. Enjoy footage of soaring gliders, the workhorse Piper Cub of early days, early helicopters, amphibious aircraft, the air car and military and commercial planes. For nostalgic history buffs this is an unusual opportunity to relive our country's rich historic aviation history. A great deal of the footage is shot from the air and gives you a sense of a pilot's perspective. Nice shots of United Airlines DC-3 preparing to takeoff, in-flight and crew operations. Particularly unusual shots include an air car setting down to ask a motorist directions to his destination, breathtaking pictures of soaring among the clouds, inside peek at a United Airlines DC-3s cabin in operation in flight, We're sure you will enjoy this entertaining film. B&W. Runtime: 9 minutes. Movie 3: Behind The Scenes on the TWA Super -Constellation ?Star of Paris? Join us for a flight from the past on TWA's Super Constellation, "Star of Paris", tail number N86511. This plane had a rich and eventful history. The "Star of Paris", later to be renamed "Star of Dublin", was christened on February 5, 1946 by the wife of the president of TWA and became the first TWA airliner to intercontinental routes. The maiden flight was from New York to Paris. It provided great domestic and international service until it was tragically lost on September 1, 1961 while taking off from Chicago Midway when a small nickel bolt from the parallelogram linkage of the elevator boost system was lost causing abrupt stall configuration and an uncontrollable crash. All souls on board perished. Other worthy segments include a primer on the basics of flying in IFR conditions (bad weather, low visibility conditions) through the sky and to touch down, glimpses into the maintenance of pilot skills and health and detailed footage of TWA maintenance and overhauls. Take the flight and sharpen your "behind the scene" knowledge of the operation of the Super-Constellation and TWA and enjoy some spectacular bonus footage such as: views of the Grand Canyon from the sky; pilot deck crew running through the pre-takeoff check list in the cockpit; actual instrument flying with the panel instruments through the sky and the approach; the bustle and discipline of plane overhaul in the shop. B&W Runtime: 25 minutes. In NTSC DVD format with a total run time of 43 minutes. Packaged in either a clear plastic CD-style jewel case or a clear plastic C-Shell DVD case without paper graphics.